Welcome to our spacious, bright and clean upgraded 1-bedroom/2-bathroom condo in one of the best condominium resorts in South Kihei. The unit (6-109) is located 60-70 feet from the pool and jet spas, 100-120 feet from an excellent free end-of-the row parking space, and 3-min easy walk from Kamaole III Beach - one of the best Maui beaches. This is a ground floor unit, so you will not need elevators or hallways, and the tropical garden is just one step from your lanai. The location and convenience of this unit is hard to beat, yet it is very private and quiet! Relax and experience Maui. The condo has plenty of convenient sleeping options: a king bed in the bedroom, a queen Murphy bed and a queen pull-out sofa in the living room all have new mattresses (2008). In-unit washer/dryer, air-conditioner, two cable TV's, a free high-speed Internet and a fully stocked kitchen will make you feel completely at home. 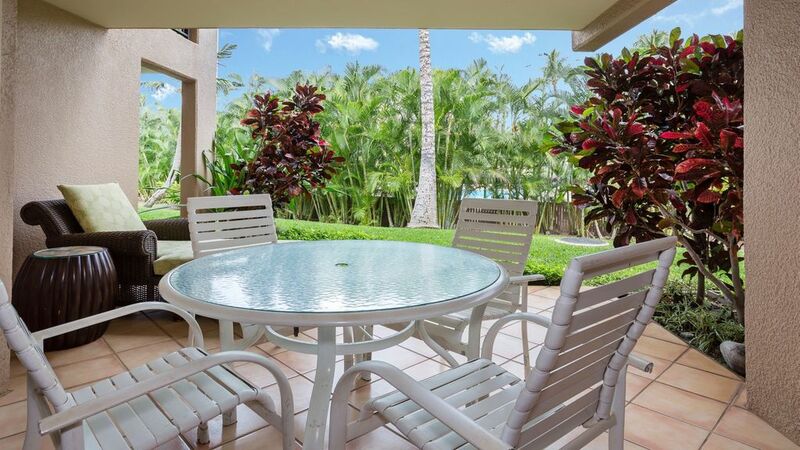 Large lanai is equipped with a big round table, four chairs and a lounge chair. We have beach chairs and umbrella for you and some sand toys for your kids. Linens and towels are provided by our on-site management company. We offer late check-outs at 1/2 of the nightly rate for stays over 10 days. What you will find on-site: a complimentary breakfast orientation on your first full day in Maui; a pool-side Mai Tai party each Wednesday with live Hawaiian music and dances; a complimentary fitness center; Pleasant Holidays Activity Desk in the lobby; two pools and two jet spas; nine barbecue areas with picnic tables; four complimentary tennis courts. Our beach - Kamaole Beach Park III - is one of Maui's best beaches and a locals' favorite. It has sandy areas to swim, rocks to snorkel, trees for shade, and the most consistent waves in South Maui to boogie board. It also has a lifeguard. Visitors and locals come here to watch sunsets every evening, and it's a great place to watch for whales during the season. Located in the only one "resort" condominium complex in South Kihei with beautiful tropical grounds. Centrally located withing the complex with the lanai overlooking the vast and colorful courtyard. The condo is on the ground floor, which is a huge convenience. You step on the grass into the tropical garden right from your own lanai. Right across the pool and yet very private - a unique combination that makes this condo very special and rare. The large lanai allows to have a chaise lounge, and we have a very nice one with a side table - relax, read, drink your morning cup of coffee or enjoy the Hawaiian music during the Mai Tai party right on your lanai. Plus, the condo is fully remodeled with an open kitchen and tile floors throughout. Plus, we have an additional queen Murphy bed (3rd bed) that easily folds up during the day to allow to have all that space for entertainment. Kamaole Beach Park III is across a 2-lane local road; 5 min slow walk from the condo. 4 people sit comfortably at the kitchen counter. 6 people can sit comfortably at the table on the lanai outside. Some sand toys in the bedroom closet. We had a great holiday but it was far too short! We really liked this condo - our friends we traveled with (they rented 5 other condos on the property) were rather jealous of our poolside access and ground floor lanai. It had everything we needed, and was clean and comfortable. Other than a brief hiccup with the safe (the owner helped me troubleshoot over the phone) we had no issues at all. We would not hesitate to recommend this property and would gladly rent from the owners again. Their booking process is smooth and the cancellation policy is appreciated, especially when booking far in advance. Thank you very much for staying with us and for your patience and help with the safe! We are happy that you enjoyed your stay and would love to have you stay with us again any time! Great location for our Maui get away! This ground floor condo was a great place for us to stay with our 4 month old. The grounds were amazing and perfect to just hang in the grass with our little. Great access to the pool from the lanai and close to a super family friendly beach and park just across the street. The condo had everything we neefed to make meals and play on the beach! Fantastic place for a family with kids!! The condo was very clean and well stocked on arrival. Loved the location in Kihei and where it was in the complex. The extra large lanai was a plus! Easy parking and easy walking to beach,restaurants and grocery store. The beds were comfortable and the Murphy bed was fantastic for two friends traveling together( no one had to sleep on a pull out! ) The owner was fantastic to work with, fast to respond. I would highly recommend this property to anyone. Thanks Elena for sharing your Maui home. Fantastic location and great accommodations! Our stay here was everything we expected and more. The beach right across the street was the best...no rocks and the finest sand I've ever felt! Boogie boarding right before sunset was perfect. Central location to everything. The condo location was great too...easy access to the pool! The condo and the grounds are well maintained. The only downside, at least for my 17 year old, was that the wifi didn't extend to the bedroom. Thank you for such a great review! Sorry about the wifi not working in the bedroom. It normally does, sometimes all it takes is to reboot the router - unplug and plug back in a minute. Our stay at kamaole sands was fabulous. The property was just as described and was well maintained and inviting. Elena our host provided every detail before our arrival which made check in and becoming acclimatized very easy. The bed was very comfortable and so was the Murphy bed. The position of the condo was very convenient for the pool and made it very easy for the kids. The location of the condo is by one of the best family beaches in Maui and you can easily walk to the beach. The condo was stocked with great beach chairs and umbrellas which was very much appreciated.I would definitely stay at this condo again.